If you are planning your summer holiday's over half term, don't forget to apply to the 49th Morland Choristers' Camp, taking place Sunday 28 July to Sunday 4 August 2019. There are still spaces available for this year's camp. Apply online at morland.org.uk. 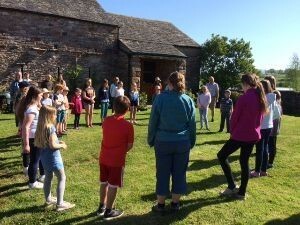 Did you also know, we also run Taste of Morland: a weekend of fun, singing and outdoor activities for children aged 6-12 at Newby End Farm, designed as an introduction to Morland Choristers’ Camp. Join us this year 11-12 May 2019. We also invite a few ‘senior’ choristers, who have attended ToM before, to join us to help the youngest members with singing and general activities. For more information and details of how to sign-up, please see our brochure. We would appreciate it very much if you could encourage friends, family, choir leaders or directors to learn about, or even sign-up for Morland Choristers' Camp and/or Taste of Morland. Let us know if you would like to receive some leaflets for local choirs, churches and schools. Help us spread the word! Thank you to those who have already signed-up. We look forward to seeing you again for another great week in Morland!